Coleridge gave much thought to the Imagination. He considers poetry the product of the secondary imagination. The secondary imagination dissolves, diffuses and dissipates in order to recreate; it struggles to idealize and unify. 1) The power of exciting the sympathy of the reader by a faithful adherence to the truth of nature. 2) The power of giving the interest of novelty by the modifying colors of Imagination. Primary Imagination: (Living power and prime agent of all human perception). Coleridge asserts that the mind is active in perception. This activity which is subconscious and is the common birth right of all men, is the work of the Primary Imagination, which may be defined as the inborn power of perceiving that makes it possible for us to know things. The Primary Imagination is a repetition in the finite mind of the eternal art of creation in the infinite I AM. The power of perception, Coleridge called as Primary Imagination whereas the poetic imagination as the Secondary Imagination. It differs from the Primary Imagination in degree, but not in kind. While all men possess the Primary, only some men possess the heightened degree of the universally human power to which the poet lays claim. Secondary Imagination: (Echo of the Primary Imagination) differs in two important respects from Primary Imagination. First, Primary Imagination is subconscious, while Secondary Imagination coexists "with the conscious will" and involves, therefore, elements of conscious and subconscious activity. Poetic "making" blends conscious selection with subconscious infusion, some elements are intentionally chosen while others are mysteriously given or supplied from the deepness of the poet's subconscious mind. Second, the secondary Imagination is described as a power that "dissolves, diffuses, dissipates, in order to recreate." It dissolves and then reintegrates the components in a new way that draws attention to their coalescence. Secondary Imagination bridges the gap between the world of spirit and matter; it fuses perception, intellect, feeling, passions and memory. It struggles to idealize and unify. Fancy: On the other hand, is distinguished from Imagination (both primary and secondary) because it is not poetic. It differs from Imagination in kind. Fancy is merely aggregative and associative; it is a mode of memory receiving all its materials ready made from the law of association. In other words, fancy joins without blending; it works together with the pre-existing sensations without creating anything originally new, fabricates without refashioning the elements which it combines. To Coleridge poetry was fundamentally and formally distinct from other modes of writing, and it possesses a logic of its own, as severe as that of science, and more difficult, because more subtle, more complex, and dependent on more and more fugitive causes. Poetry could and should bring together thought and feeling; it should reconcile the workings of both the head and the heart. Coleridge says that Wordsworth had unified thought and feeling in poetic utterance; he has both realized and idealized the common place and had made the reader see man and nature as if he was seeing them for the first time. Therefore; at times he seems to be still aware of the sensationalist philosophy of his youth which from it he inherits a conception of a world of facts, an inanimate cold world in which objects as objects are essentially "fixed and dead." But as a poet his task is to transform it by the imagination. He has a deep trust in the imagination and considers it as something which gives shape to life. His dead world may be brought to life by Imagination. He believes that meaning is found for the existence through the exercise of the creative activity which is a kin to that of god. As a poet, Coleridge was fascinated by the notion of unearthly power at work in the world. Thus, because of his belief that life is ruled by powers which cannot be fully understood, the result is a poetry more mysterious than that of any Romantic. However, because it is based on primary human emotions, he thought that the task of poetry is to convey the mystery of life. 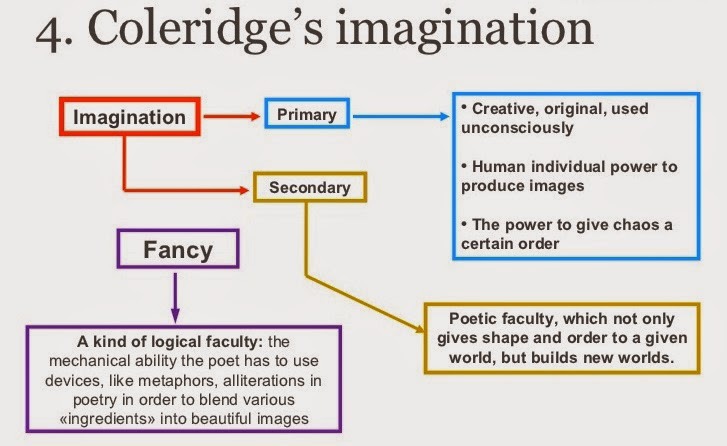 Coleridge believes in Imagination as a vehicle for truth. He felt about the creation of his imagination something similar to what he felt about dreams. He assumes that while we have them, we do not question their reality. Coleridge believes that creation needs joy, so without joy the poet is helpless and miserable. A poem Coleridge defines as an organic construct which, unlike works of science, proposes for its immediate object "Pleasure not Truth." In other words, while truth is the ultimate end of poetry, pleasure is its immediate end. Coleridge's definition of the ideal poet is characterized by its emphasis on imagination. The poet described in ideal perfection, bring the whole soul of man into activity, with the subordination of its faculties to each other, according to their relative worth and dignity. He diffuses a tone and spirit of unity, that blends and fuses each into each by that magical power, imagination and synthesis. In Coleridge's view, Wordsworth's particular genius was Miltonic; his strength lay, as the Prelude had demonstrated, in impressing the stamp of his own mind and character on all that he chose to write about.